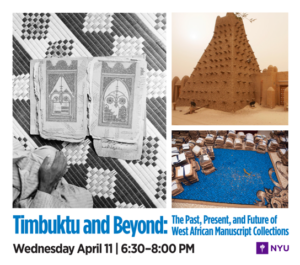 A fundamental source for the history of West Africa lies in rich archival collections, most famously the manuscript libraries of Timbuktu. Documents from the Mali and Songhai Empires and the centuries before European colonial rule offer a vital window into the region’s complex ties to the wider Muslim world, and to cultures and polities in Africa, Europe, and the Middle East. The participants will discuss their experiences with West African documents, as well as the challenges of consulting and protecting these renowned archives of human history.